Ashleywilde Software's Storybase is a brainstorming tool for writers. 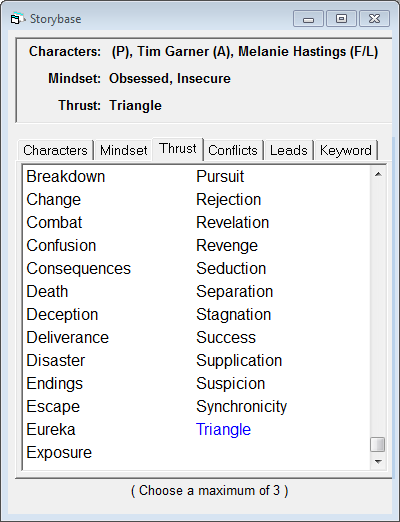 It's designed to help you generate ideas for increasing the conflict in your story. It does this by using a database of "narrative situations" that it proposes in response to information you provide it. 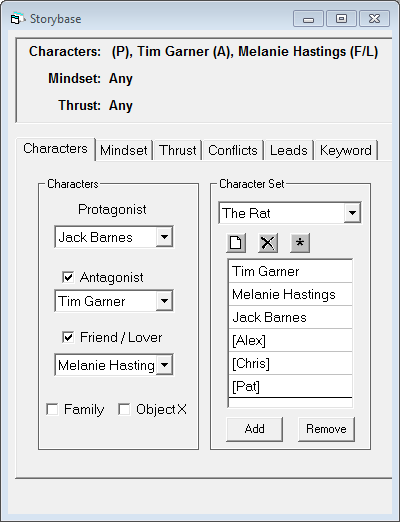 I think of the output of Storybase as something like emailing a writer friend to briefly describe your characters and story, and having send you back a bunch of ideas about things that might happen in your story. Just as with ideas generated by a friend or colleague, Storybase will provide some ideas that you look at and think "Yeah, that might be interesting" and some that you read and think "What were they smoking when they came up with that idea?" To demonstrate the software in real-world use, we'll use a hypothetical story. I'll give it the working title "The Rat" and define three main characters. Jack Barnes is the hero or protagonist of our story. He's in love with Melanie Hastings, and so is another man named Tim Garner. Let's say that right now, that's all I really know. I've no idea how I want this to play out, so I fire up Storybase. 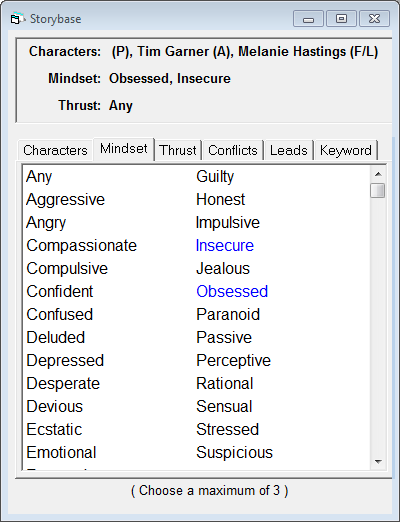 Now that I've filled in the character set and names, I click the "Mindset" tab to tell Storybase up to three words that describe my protagonist's mindset. 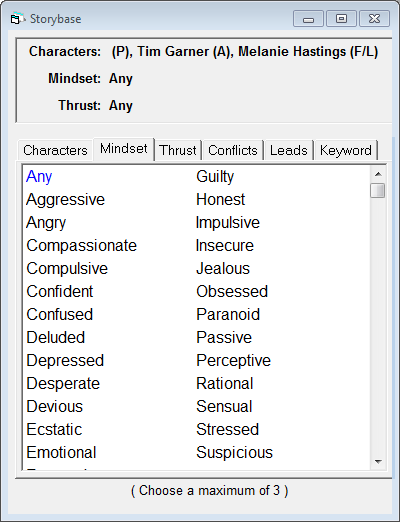 Choosing "Any" makes all mindset options available. In the lower-right corner, we see that Storybase has found 102 different situations I might choose to write between these three characters. 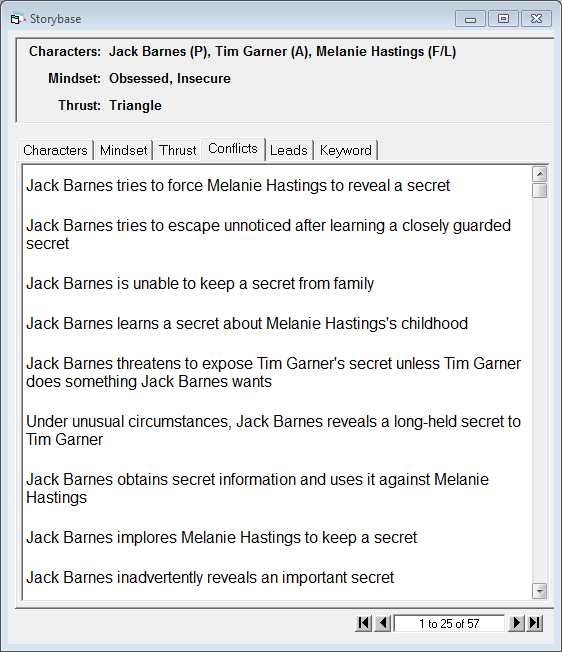 Let's say I select "Knowing something about Tim Garner, Jack Barnes warns Melanie Hastings to stay away." Now I click the "Leads" tab to identify conflicts that might lead into and out of that conflict. In this window, you see the conflict I chose earlier in the middle box. Above and below it are boxes offering situations that lead into and out of that selected conflict. Storybase offers me 12 ways I can lead into the "Knowing something about Tim Garner" conflict and 9 ways to lead out of it. Jack Barnes is unaware of Melanie Hastings's prior relationship with Tim Garner. 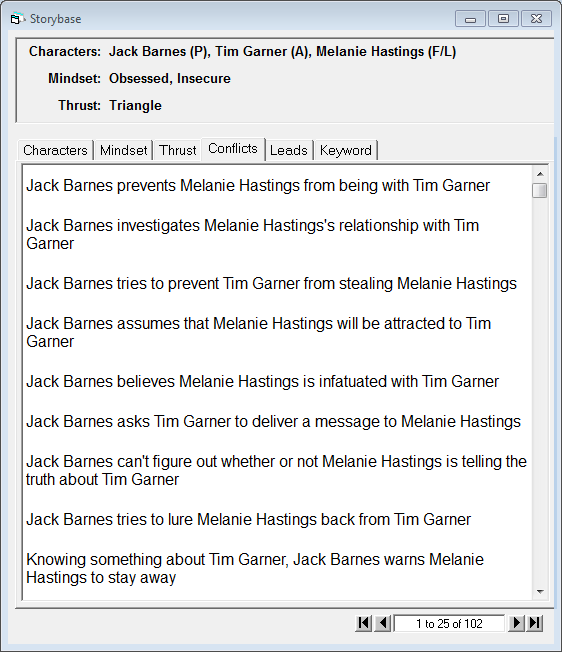 Jack Barnes thinks Tim Garner did something when really it was Melanie Hastings. Jack Barnes asks Tim Garner to deliver a message to Melanie Hastings. Jack Barnes regrets introducing Melanie Hastings and Tim Garner. Jack Barnes believes Tim Garner is hiding something from Melanie Hastings. Jack Barnes is surprised by what Tim Garner knows. After a personal setback, Jack Barnes notices Melanie Hastings losing interest. Jack Barnes is crushed to see Melanie Hastings getting together with Tim Garner. 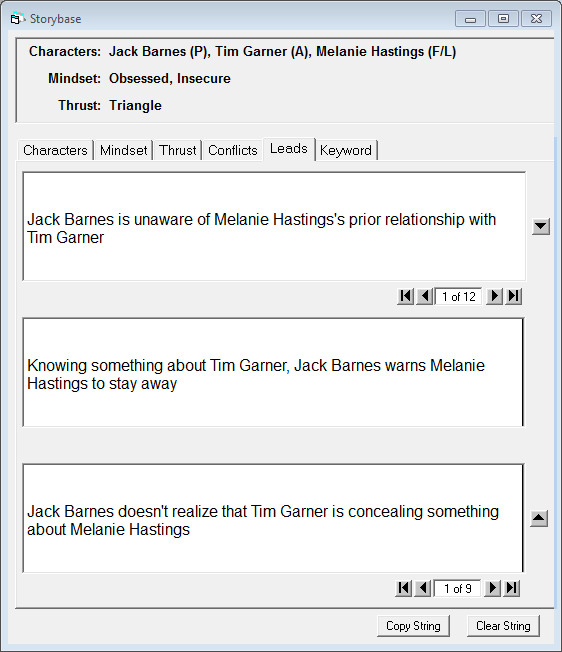 Jack Barnes feels that Melanie Hastings has a fundamental misconception of Tim Garner. Jack Barnes learns something about Tim Garner that Melanie Hastings doesn't know. Jack Barnes explains to Melanie Hastings why a relationship wouldn't be good for either of them. Let's say I've decided that this is an early situation in the story. Jack's decided that he wants to date Melanie, and he is worried that she might be more interested in his friend Tim. Maybe Tim's more handsome and wealthy than Jack is, so Jack's a little threatened. Jack knows that Tim once conned an older woman into giving him the money to start a business that he sold for a million dollars. He thinks if Melanie know about Tim's swindle, she might not like Tim as much. I'll choose the lead-in "Jack Barnes feels that Melanie Hastings has a fundamental misconception of Tim Garner." She thinks Tim's basically a nice, honest, self-made man... when in reality he isn't above lying and cheating to get what he wants. Unforeseen events delay a rendezvous between Jack Barnes and Melanie Hastings. To achieve an objective, Jack Barnes boldly defies social standards. Jack Barnes does something that causes Melanie Hastings to laugh hysterically. Jack Barnes tries to destroy Tim Garner's ability to communicate. That third one sounds intriguing. Perhaps once Jack gets together with Melanie, he tells her about how Tim Garner convinced an older woman to give him a bunch of money under false pretenses. When Jack tells her this, thinking it will destroy her image of Tim, she begins laughing at him. She tells him that she knew all about that that, and in fact was in on it with Tim. She played Tim's devoted wife and gave Tim the credibility he needed to pull off the con. This little news is likely to rock Jack's world and shake his image of Melanie! I'm really only offered two here, "Jack Barnes starts to doubt feelings for Melanie Hastings" and "After looking elsewhere, Jack Barnes begins to appreciate Melanie Hastings." The first one seems more realistic to me, so I'll choose that one. This is the gist of what Storybase is all about. Using your actual character names, the mindset of your main character, and the thrust of the story, you get a list of suggested scenes or situations that you might want to consider using (or not). It doesn't "give" you a story to write, doesn't force you to write to a particular model or structure, or anything like that. It's like having a friend who can throw lots of "well, what about this..." kind of situations at you when you need them. Storybase offers me 57 different situations that involve secrets in some way. I can pick and choose the ones that will help me in my particular story. Although Storybase isn't a particularly complicated or confusing program to work with, Ashleywilde Software has included help and tutorial functionality within the product. Above is not the entire help system. Many of the underlined words are links that can take you to additional information about a particular topic. Storybase has very light hardware requirements, which pretty much any PC made in the last several years can meet. You need the Windows operating system (95, 98, 2000, XP, Vista, 7, 8, or 8.1), a Pentium 166 MHz or higher processor, 64MB or more RAM, 128MB of free hard disk space, a screen resolution of at least 800x600, and a CD-ROM drive. Installation is quick and easy. You launch the installer on the CD, click through a wizard-based installation process, and the software is installed. It took me about 1-2 minutes to install. 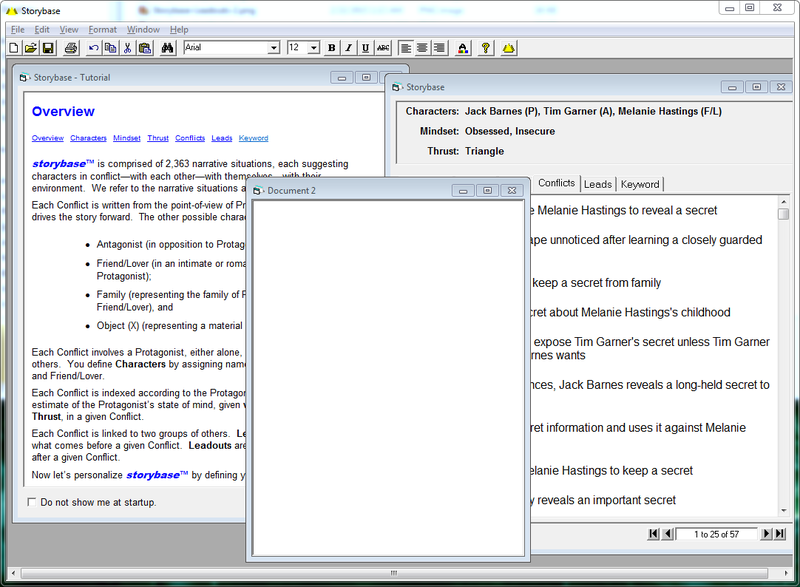 I see Storybase fitting into my writing toolkit in a number of ways. If I've got in mind a partial story that I'm trying to flesh out, I think Storybase could help me there. 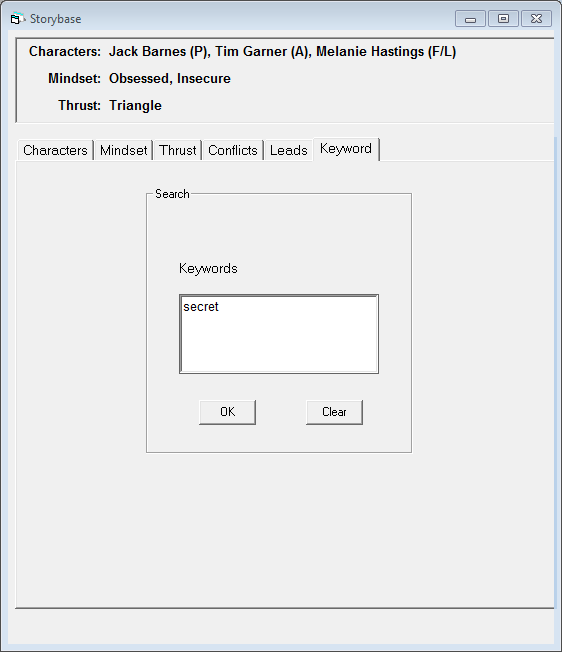 I could easily sit down with it, enter in my character names, then poke around with the Keyword search and Conflicts functions to start identifying situations or scenes I might want to toss my characters into. In this situation, Storybase would help me flesh out the story idea. I'd transfer the ideas it sparked into some other package to do the actual writing. 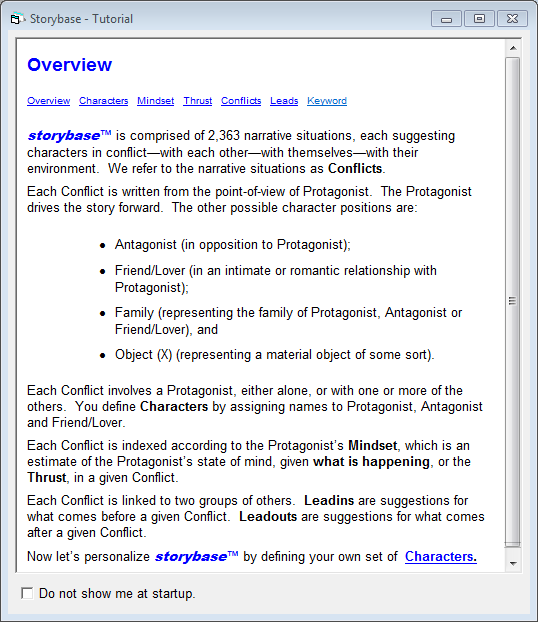 Storybase has a very simple text editing window, but not one that I'd personally want to do more than keep notes in before transferring them to Microsoft Word, Scrivener, or some other tool. The best way to get a feel for whether Storybase is a worthwhile purchase for you might be to check out the Storybase.net Beta site that is online as of this writing. That site has a subset of the features of the full Storybase product, and gives you a good way to test it and see if Storybase will help you in your own writing activities. If so, then you can pick up a copy on Amazon.com for $49.95.